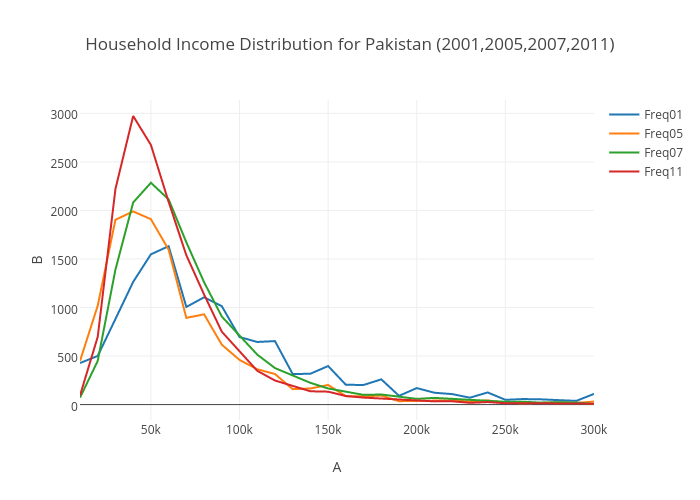 G.zahid's interactive graph and data of "Household Income Distribution for Pakistan (2001,2005,2007,2011)" is a line chart, showing Freq01, Freq05, Freq07, Freq11; with A in the x-axis and B in the y-axis.. The x-axis shows values from 10000 to 300000. The y-axis shows values from -158.83333333333334 to 3137.8333333333335.